We headed to Pakenham's twilight meeting with a degree of confidence in our two runners Margin Trader (pictured) and Tivaci and it was fantastic to see them both win in such impressive style. Stepping up to 2500m for the first time, Margin Trader was down in class but up in weight and off a slightly tardy start he did not get the best of runs in transit - covering ground from his wide gate. "He had the hardest run in the race under top weight so it was a good, tough effort," Michael Moroney said, pleased that the four-year-old is in such good form (twice successful from his last three stars) after a couple of set-backs last year. "He got kicked by another horse and injured and at one stage he got really crook and we had to rush him off to Werribee." 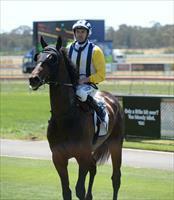 Fortunately Margin Trader is a sturdy type and we are hoping that he can now go on to measure up in stronger company. "He is learning to settle better now," said Moroney. "He used to be a hard going horse and he went too far last time in, he was over relaxed! So we have taken the ear muffs off and he is going well now. And we think he will be better again in his next preparation." Raced in partnership by several groups headed by Ballymore Stables Australia, Margin Trader is a son of Tavistock and Power And Might who, as her name suggests, is a close relation to Might And Power. The second leg of our Pakenham double was the talented Tivaci who was having his first run since running fifth in the Carbine Club Stakes at Flemington last October. A horse who has always shown above average ability, the High Chaparral colt has been rather green and wayward in his races but we were excited by how professional he was today. "He did a lot wrong last campaign," Moroney said, "but he has been a long way better this time in and what I really liked today was how he did everything right. He seems to have turned the corner." "When he won his maiden he ducked right in during the run home but today he was straight right through to the line, he seems to be learning what it is all about." Moroney briefly toyed with the idea of gelding Tivaci last spring but put his lack of racing smarts down to immaturity rather than hormones - "he has always been a lovely horse around the stables so we took the punt and left him a colt." Whilst "he has a lot to do between now and then," Tivaci is being aimed at the Australian Guineas and it would be a big thrill for connections led by Lib Petagna to get to such a renowned Classic. Jockey Mark Zahra rode Tivaci in a jump-out a couple of weeks ago and such was the good feel the horse gave him that he keenly asked for the ride. "It is no easy feat to take on the older horses and beat them," he said after Tivaci's 1 1/2 length victory. "He is a very nice horse with a great action, he really gets down low and he put them to bed pretty easily today." Bred by the late Bart Cummings, Tivaci is a son of High Chaparral and the Fastnet Rock mare Breccia whose dam, the Perth Cup winner Luna Tudor, also produced the Toorak Handicap winner Allez Wonder.